Back in October I was intrigued to see hoardings go up for a new eatery in Aberdeen's Union Square shopping centre. At that point the name Byron meant nothing to me, however when I posted about it on social media there was an excited reaction. This would be the first Byron in Scotland and their reputation for proper hamburgers clearly preceded them. As their opening date of 17th December approached a parcel arrived for me with a bottle of their Hot Sauce, Byron Larger and a card to wish me a Happy Cheesemas and invite me to visit in January. On a twixtmas visit to Union Square there was a huge queue outside waiting for a table and when we finally visited on a Saturday night midway through January the situation was no different. It was a wee bit confusing knowing quite what to do as we had a reservation. Half our party joined the back of the queue whilst two of us awkwardly pushed in at the front to see what the deal was. Once our booking was found we were quickly taken to a comfortable booth and introduced to our waiter. 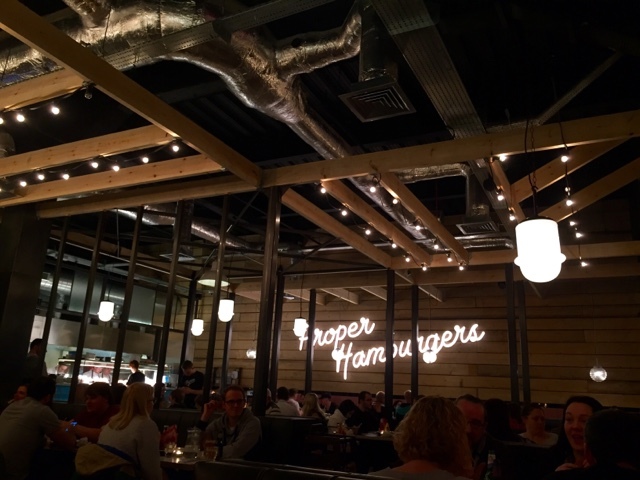 The restaurant was bright and modern with a look that seemed to be a cross between American diner and industrial warehouse. As we perused the menus and ordered drinks our waiter explained that their burgers were cooked medium so would be pink in the middle. All good by me. 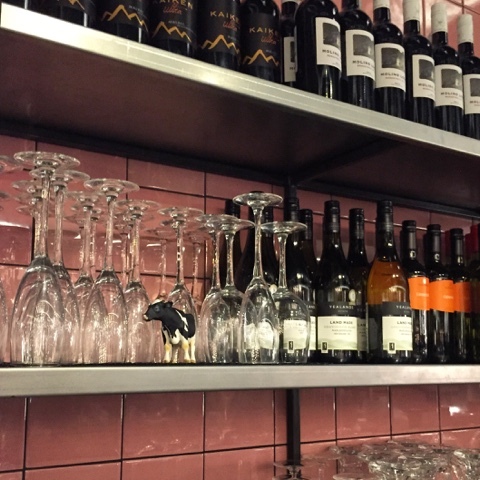 He also told us that there were 12 miniature plastic cows hidden around the restaurant for us to find. This proved to be great fun for both little and big kids. We had heard great things about the thick Byron Milkshakes so girl ordered an Oreo one and boy a Maple & Salted Popcorn. You can also get hard shakes with a shot of Bailey's Bourbon or Rum. When they arrived the kids eyes popped out of their heads! "When he said they were big I thought he meant big milkshake glasses not buckets!" The shakes were indeed awesome and super thick. There's no way I could have drunk/eaten one, a sip of each was more than enough for me. Perhaps more suited as a desert. Time to order and I'd been given a few recommendations on social media of what to go for so we ordered 3 different burgers and a selection of sides. 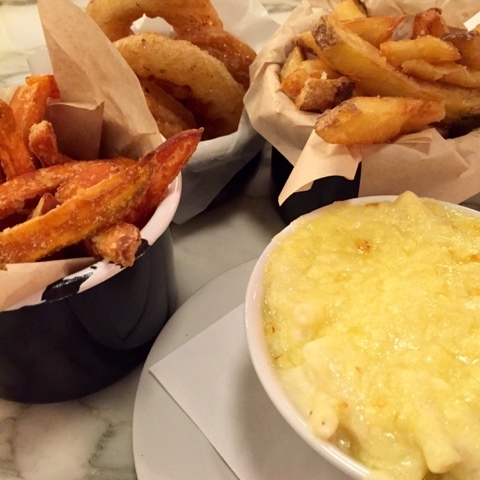 Girl isn't really a burger fan so she chose Macaroni Cheese and Sweet Potato Fries. There aren't any starters on the menu but we went for the "While You Wait" Nachos (for two). Back to the cow hunting whist we waited the estimated 7-10 minutes for our burgers. Our nachos arrived pretty quickly with our burgers and sides very shortly behind. Such was the speed of service that I wouldn't bother with anything for the wait on a future visit as we'd literally only managed a couple of chips each before the main event arrived. Girl said her Mac Cheese was the best and cheesiest ever and practically inhaled her dish of sweet potato fries. They were unbelievably good, so much so that we ended up ordering a second portion as the rest of us ate so much of hers! Boy opted for a Smoky Burger (cheddar, bacon, crispy fried onions, iceberg, pickles and smoked chilli BBQ sauce) which rather strangely arrived with a "Well Done" flag. We never queried this but can only assume they have a policy not to give medium burgers to kids. Would have been nice to have been asked/told as my 13 year old mini foodie would definitely have chosen pink. Foodie Loon chose the classic Byron Burger (bacon, cheddar, iceberg, tomato, red onion and Byron sauce) and I went for B-Rex (onion ring, bacon, American cheese, jalapeños, pickles, onion, BBQ sauce and mayonnaise). The burgers were pink, juicy and generously sized and the toppings and sauces all hit the spot. The skin on chips were almost as good as the sweet potato fries and whilst I was really excited about, and had been recommended the courgette fries they were just too greasy, as were the onion rings. 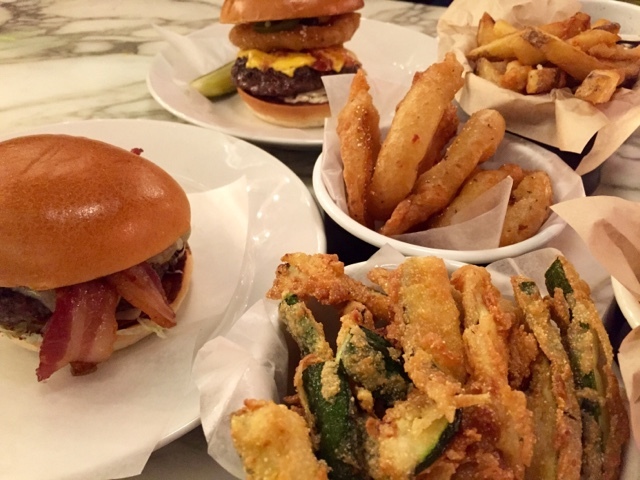 All the burgers come in a a delicious squishy bun and are served with a large pickle on the side. As there were no other pickle lovers I got all three. Surprisingly some people still had room for desert. 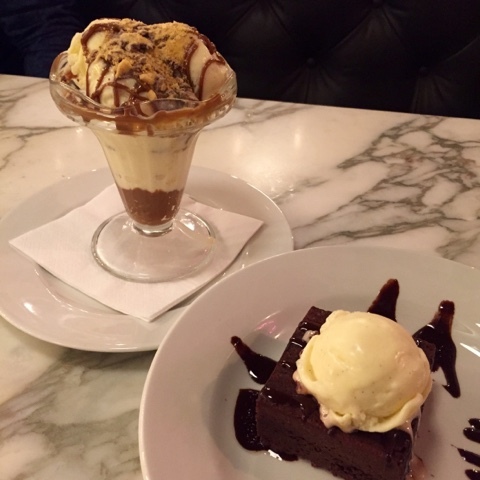 Whilst I opted for a cappuccino and boy had a Cream Soda float, father and daughter went all out with a Chocolate Brownie and a Caramel and Honeycomb Sundae. Service throughout was friendly and efficient and the staff were happy to help my daughter in her quest to track down all 12 cows. She was a wee bit disappointed that there wasn't a prize for finding them all. Perhaps something to think about - she'd have been happy with a sticker! We also loved the staff T-shirts with "pickle" and "cheese" tying for top place in my affections. The bill came to £102.40 which seemed a wee bit on the steep side. 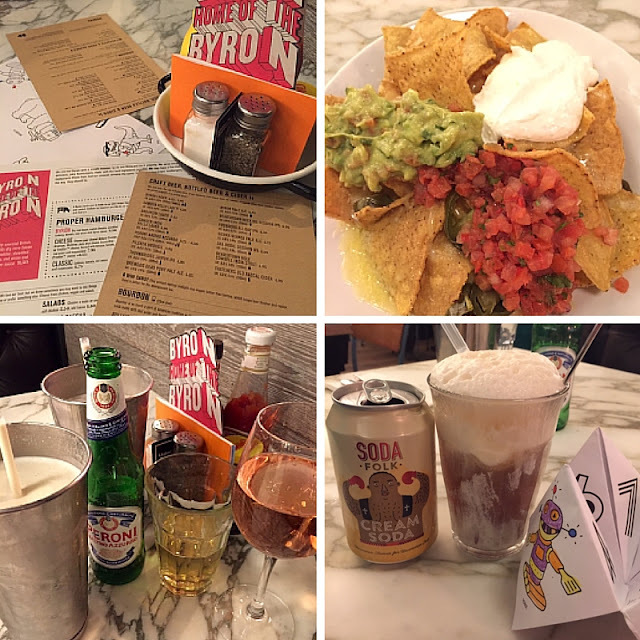 Between the 4 of us we'd had Nachos, 3 burgers, 6 sides, 2 deserts, 2 milkshakes, 1 soft drink, 3 alcoholic drinks and 2 coffee's. However we really didn't need the nachos or deserts which would have knocked off £15 and my two large glasses of wine accounted for a further £13.50. We loved the atmosphere in Byron and there were folk queueing for tables the whole time we were there. We'll definitely be returning and would be a bit more savvy in our ordering next time. I liked the idea of the skinny burger served without bun but with side salad. I also need to try the blue cheese dip which everyone told me was a must try but I completely forgot to order. I also really hope that they regularly moo-ve the cows around. Byron have provided £30 of Byron Bills as a giveaway for readers of Foodie Quine. Entry is via the Rafflecopter widget below. Check out their locations to make sure there's a branch near you. To enter, let me know in a comment "What's your favourite burger topping?" For additional bonus entries you can follow me on Twitter, Tweet about the Giveaway or like me on Facebook. Giveaway ends 5th February 2016 12:00am. Good Luck! Disclosure : Byron invited us to review a complementary meal. All views expressed are my own. This is not a paid post. Simple burger sauce (yeh, I'm trashy) Haha. I'm a big fan of brie and bacon on burgers! I love Stilton and Mushroom ... 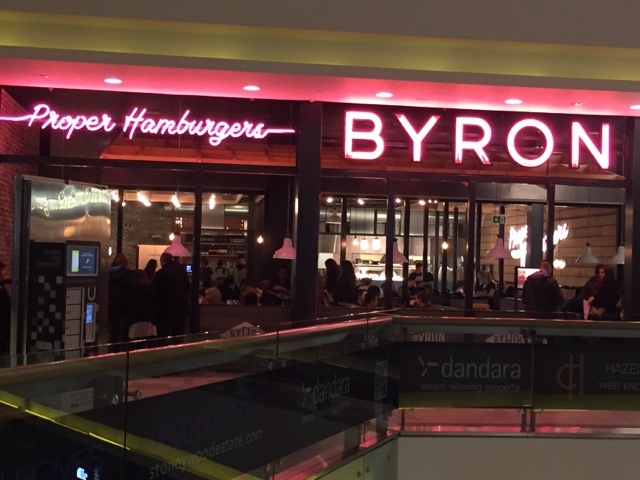 I must say we went over the Christmas period to Byrons in Derby and it was by far the best burger I have ever had. Has to be crispy bacon! I'm vegetarian so any veggie burger topped with halloumi and tomato relish is delicious for me! 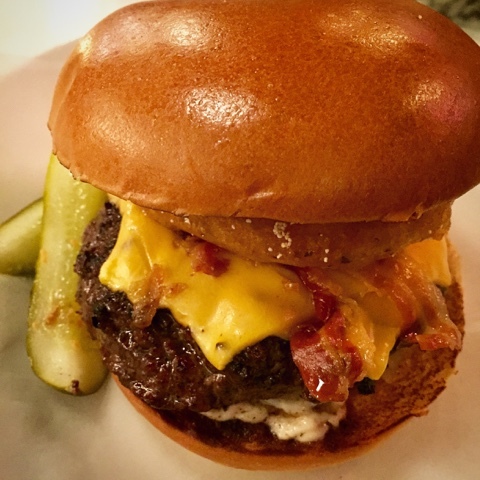 Cheese, bacon & burger sauce! Salad, ketchup and crispy bacon! Lots of cheese and crisp, meaty bacon! What an incredible place. I agree a little much for 4 but with such wonderful food I couldn't imagine a better night out. Looks good and I do love sweet potato fries. Do they do veggie burgers? I love Halloumi, but any cheese is good with me! Tomato ketchup...I like it simple! Blue cheese or caramelised red onions...preferably both! Pico de gallo and a little cheese... Or guacamole or red onions .... Hmm too many options! I LOVE guacamole on a burger - Mexican style all the way! Cheese, bacon,mushroom,pulled pork,hash brown, egg....How much can Ifit on this burger? I've now got my burger order perfected. I like a big thick beef burger, monterary jack cheese, streaky bacon, slice of tomato, avocado slices (or guac, not fussy) and just a little BBQ sauce not a lot! And definitely no lettuce :P not fussy am I? I'm glad you enjoyed Byron I rely on them a lot for a quick tasty meal! As for the boy's burger. The Food Standards Agency tells businesses they have to serve kids burgers well done as they don't consider medium or rare burgers safe. Some places won't serve adults pink burgers either, just to be on the safe side! Classic Cheddar and Bacon. Can't beat it! Cheese, peppers, mushrooms - think cheese steak. Avacado! Makes it nice and creamy. My goodness - those burgers look divine! Relish and an onion ring! Bacon & Cheese all the way! cheese and loads of bbq sauce! Burger sauce, don't know what's in it but it's beautiful! ketchup and fried onions, mmmm! At Byron it's definitely jalapenos! Cheese and Bacon for me please! Cheese and bacon, always a winner! My absolute favourite is bacon, cheddar and some homemade bbq sauce! Love love love mushrooms and brie and an egg! Cheese, bacon, bbq sauce and onion rings. A bit much, but it's good! !